"You will find my story is a lot like pie, a strawberry-rhubarb pie. It's bitter. It's messy. It's got some sweetness, too. Sometimes the ingredients get added in the wrong order, but it has substance, it will warm your insides, and even though it isn't perfect, it still turns out okay in the end." When journalist Beth M. Howard's young husband dies suddenly, she packs up the RV he left behind and hits the American highways. 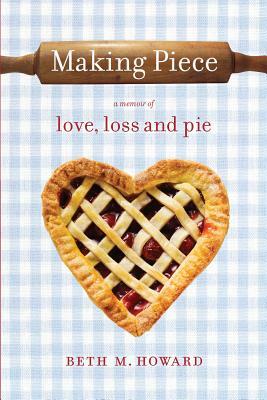 At every stop along the way--whether filming a documentary or handing out free slices on the streets of Los Angeles--Beth uses pie as a way to find purpose. Howard eventually returns to her Iowa roots and creates the perfect synergy between two of America's greatest icons--pie and the American Gothic House, the little farmhouse immortalized in Grant Wood's famous painting, where she now lives and runs the Pitchfork Pie Stand. Making Piece powerfully shows how one courageous woman triumphs over tragedy. This beautifully written memoir is, ultimately, about hope. It's about the journey of healing and recovery, of facing fears, finding meaning in life again, and moving forward with purpose and, eventually, joy. It's about the nourishment of the heart and soul that comes from the simple act of giving to others, like baking a homemade pie and sharing it with someone whose pain is even greater than your own. And it tells of the role of fate, second chances and the strength found in community. Beth M. Howard has been a journalist for more than 20 years, specializing in personality profiles, adventure travel and outdoor sports. In 2001, she quit a lucrative web-producing job to bake pies at a gourmet deli in Malibu, California. She started her popular blog, The World Needs More Pie, in 2007, and it has been featured in publications worldwide. She lives in Eldon, Iowa. Visit her at TheWorldNeedsMorePie.com.